The Wilson Pro 1050 is a powerful cellular amplifier designed specifically for installations with long cable runs. This is perfect for installations in wide horizontal buildings, basement levels of buildings and multi-story structures where long cable runs are often a problem. The innovative technology in the Pro 1050, allows you to achieve results which were until now impossible, all at a fraction of the price of an active DAS system. Many times when installing a cellular amplifier system in a large building, covering the main floors isn't a problem. However, there are hard to reach areas like basements, due to the long cable runs necessary. With so much cable loss between the antenna and the amplifier, the coverage area in these hard-to-reach areas is small, or non-existent, because there simply isn't much signal to work with at that point. 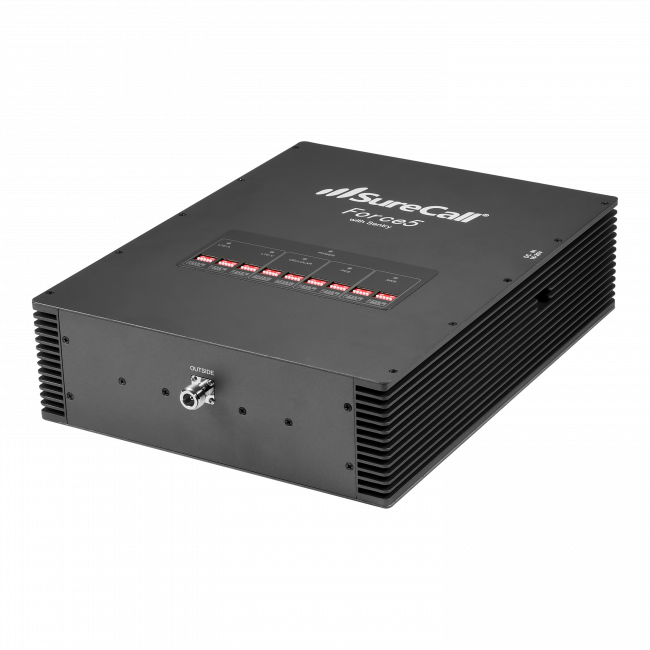 The Pro 1050 is the first cellular signal amplifier of its kind. It was designed specifically to solve this situation. It compensates for cable loss and long cable runs anywhere from 100 to 300 feet, using an inline signal amplifier. 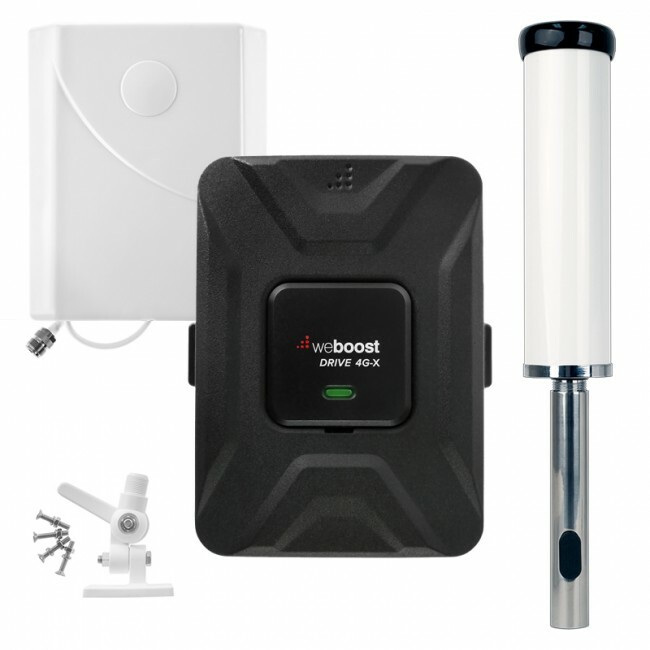 This capability to overcome significant signal losses allows the Pro 1050 to provide cellular coverage in areas that were previously impossible. The Pro 1050 is a specially designed two-part system consisting of a main amplifier unit and a separate inline unit. The inline unit is installed between the main amplifier and the broadcast antenna, and provides additional amplification to compensate for signal loss in up to 300 feet of cable. Throughout the video I reference signal loss and cable, when I do so I'm referring to Wilson 400 cable which has a loss of 3.5 dB at 700 megahertz and 6 dB at 2150 megahertz per 100 feet. The Pro 1050 will work with other types of cables as well, you'll just need to calculate the signal loss for the type of cable you're using when creating a system layout. 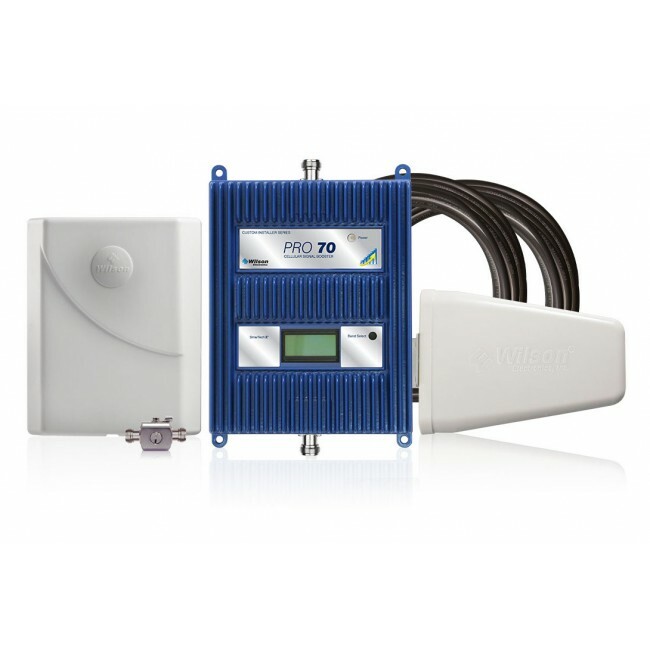 Like all Wilson Pro solutions the Pro 1050 is FCC approved and operates under part 20 FCC rules, meaning that it is pre-approved by all carriers. Not only that, but it comes fully loaded with sophisticated onboard software, auto calibration and XDR technology. As with all Wilson Pro amplifiers the Pro 1050 is designed with advanced internal programming, which allows it to automatically adjust for a variety of conditions, while still boosting weak cell signal. Each amplifier unit will continually monitor and adjust itself to provide the maximum amount of coverage inside, all without the need to manually set or adjust anything. The two amplifier units automatically link, calibrate and adjust themselves upon power up, and communicate with each other continually, keeping the system performing at maximum output. The inline amplifier will automatically calculate the signal loss through the cable for the system, and provide added gain of 4 to 25 dB to make up loss for 100 to 300 feet. The main amplifier will communicate to the inline how much output power it started with, and the inline unit will add power back into the system that was lost to the cable, up to 25 dB, to provide the same output power that the system began with, up to 15 dBm. With XDR Technology built-in, you'll never have to deal with overloading issues, no matter how strong the incoming signal. The system will never overload and shut down, saving you time and money. The system will adjust its gain according to the incoming signal and provide great consistent coverage inside the building. 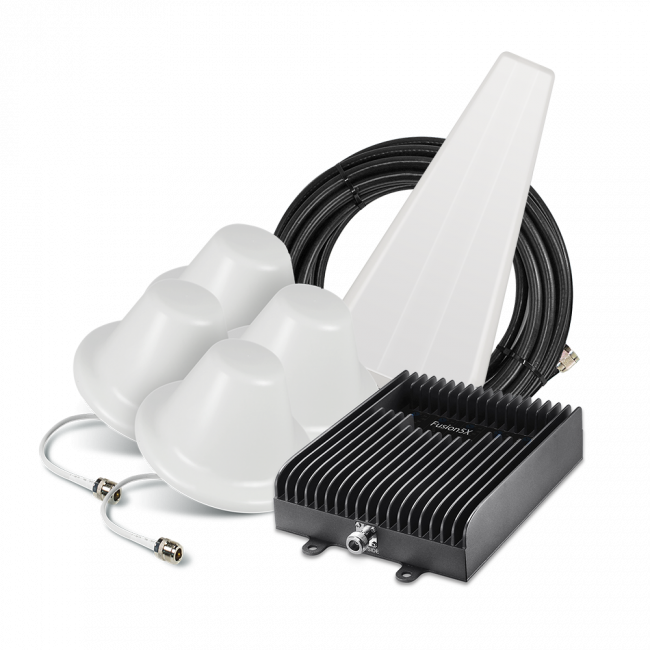 The Pro 1050 is also modular and can be configured in any number of ways to fit your installation, as long as you follow this layout: The inline booster must be connected between the indoor broadcast antenna or antennas and the main amplifier unit. Do not attempt to split, attenuate or apply filters between the main amplifier and the inline unit. This must be a direct connection. However, on the broadcast antenna side of the inline booster, you can split out to multiple antennas, apply filters and so forth. As long as you remember this rule of thumb, the Pro 1050 can be customized to fit nearly any installation. The Pro 1050 works well on its own, but in most cases will be utilized as a companion amplifier to the pro 4000 or the Pro 1000. One of these boosters will be used to provide coverage for most of the building, while the Pro 1050 would be used to cover those hard to reach areas like basements. The Pro 1050 contains two booster units, but is designed as a system, both 1050 amplifiers must be installed for the 1050 system to function. If the 1050 main amplifier detects that the inline amplifier is not installed, it will not even power on as a safeguard. Likewise, the inline amplifier will not power on if it does not detect the 1050 main booster is installed. The 1050 cannot be used to add additional amplification to other systems. For example, installing the inline amplifier with a Pro 1000 or Pro 4000 amplifier, or installing a complete 1050 system downline from another amplifier. It will also not add more amplification to a system than as needed or allowed by the FCC. For example, installing multiple inline boosters between the broadcast antennas and the 1050 main amplifier. You can however split the signal coming from the donor antenna to multiple amplifiers, including the 1050 to cover different parts of the building. If you'd like to know more about the Pro 1050, or any of our other boosters, check out some of our other videos or visit us online. Don't forget to subscribe to our channel for more videos like this every week. Thanks for watching we'll catch you next time.